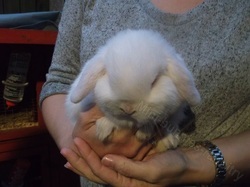 We are hobby breeders of Mini lop, Lion lop and Netherland dwarf rabbits. We have only just started down the hobby breeding road and so a lot of our rabbits are still only young and we are excited to see what colours we will get from which matings. We are a family based rabbitry which is run by myself Suzanne and my daughters Holly and Rosie when they can, they also have their own rabbits. Any monies made goes back into the well being of the rabbits through food, bedding and vets bills if there is ever the need.